This particular article marks a bit of a milestone for me [ed: and me], as this will be the 100th instalment in the FashionBeans Men’s Fashion Basics series. When I first started writing the series over three years ago, I never thought it would go down quite as successfully as it did, or keep going for as long as it has. It’s a testament to how our readers want to be as knowledgeable as they can about men’s style, and just how much depth and detail there is within the world of menswear. So I was thinking about doing something special to mark the occasion, and seeing as my normal tactic of ‘get wild ar*e drunk’ doesn’t really work in this sort of medium, I went ahead with a suggestion from one of our readers, Alex Martin. He said that it would be nice to have a round-up of all that has gone before in the series, as sometimes (not unlike men’s fashion) it can be hard to keep track of everything. Taking a brief look back through the articles, I have to agree with him. We’ve covered a lot of ground – all the way from perfect fit to dressing for a summer wedding, and everything in between. Perhaps a bit of a recap would do us all good. If your clothes fit you properly, regardless of the price of the item, it will always look like it was made for your body. Finding a high quality tailor was essential for one of the biggest leaps forward I made when first starting out, and helped achieve that sought-after slim fit that perfectly follows my silhouette and flatters my body shape. 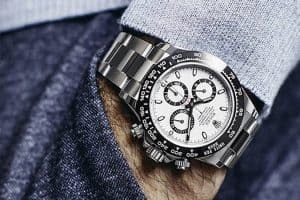 In terms of the type of clothes you buy, investing in pieces that are simple, classic and versatile allows you to not only justify an extravagant price tag (as they will last you numerous seasons without ever going out of style) but also means that the majority of the items in your wardrobe can be mixed and matched with minimal hassle or clashing. Even if you only take those two lessons away from this series, I’d consider it a job well done. But anyway, let’s have a brief look at all that we’ve learned so far, shall we? The sleeves should finish mid bicep, whilst the body should be slim through the torso and end a couple of inches below the waist. They work perfectly by themselves with a pair of jeans and boots or can be dressed up with an unstructured blazer and chinos. I’d recommend buying some basic versions that can be used as under shirts, in order to preserve your dress shirts, and others to be worn without. Staple tees in white, grey and navy offer the most versatility. Black is an option, but it does limit what you can pair it with and only really looks good in the evening. A brief word on Henley tops: as long as they fit you well in the body and aren’t too tight in the arms, just treat them exactly the same as you would your t-shirt collection. Add a touch of detailing to any simple outfit by playing around with how many buttons you do up on them. As always, fit is king. For beginners, slim – not skinny – is what you should aiming for, and don’t be afraid to take them to a tailor to get them just right. Always own a pair in a raw indigo colour and then possibly venture into grey and black washes, if denim really is your thing. Keep the design simple – no man made distressing and definitely no logos or words on the back pockets (or anywhere else for that matter). If your budget will stretch, go for selvedge as the quality is much better and they will last so much longer. Be prepared to wear them in though. Treat them exactly the same way you would a pair of jeans. Aim for pairs that are a little less that can be worn formally and casually. Opt for neutral colours like navy, grey and shades of brown and you really can’t lose. They look their best when worn with a form of tailoring, such as a suit jacket or waistcoat. 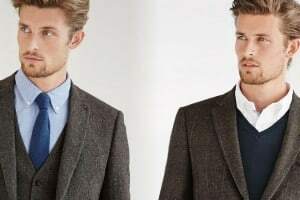 When it comes to fabric, remember to adjust to the season – tweed, heavyweight cottons or corduroy in the winter and linen, lightweight cottons or seersucker for the summer. Finally, remember that not all chinos are the same. Whether jumpers or cardigans, make sure they aren’t so tight that you can’t layer a piece underneath but are cut slim through the sides. Merino wool is the most common material used, but look into lambswool and cashmere if you’re interested in beefier or more luxurious fabrics. V-neck jumpers communicate a more formal tone, whilst crew necks look great over a shirt or by themselves under a casual jacket. Thin gauge cardigans work well when layered under a formal jacket whilst thicker versions (such as shawl necks or belted versions) can be used as an outer layer on their own due to the thickness of the wool. Roll necks are back ‘in’ these days, but as long as you nail the fit (slim, not too tight round the neck) they can be worn in much the same way as a cardigan. Make sure they fit you in the neck and sleeves. You should be able to fit two fingers comfortably between your neck and collar and when you turn your head the collar should stay still. The cuff should end where your thumb and wrist meet. Everything else depends on the cut of the shirt and can be altered by a tailor (or yourself) to find your perfect fit through the sides. See my Ultimate Streamlined Shirt Collection article for a guide on what types of shirts you could look to invest in. Whether you’re a leather, denim or a straight up Harrington man, you should follow one simple rule when buying a casual jacket: try on the size below what you normally go for. It seems to be the case that most guys go a size too big for layering, when there really is enough room in the size down as well. You want it to be snug on your shoulders and end around (or a couple of inches below) your waist. Try dressing your casual jacket up with suit trousers or shirt and tie combinations to create interesting juxtapositions and a variety of perfectly balanced smart-casual ensembles. One white and one black pair of trainers with minimal detailing is all you need, with the neutral colour ways enabling you to pair them with more formal pieces, if required. Look at getting a pair of neutral boat shoes for the summer and a pair of leather loafers for the winter – your clothing isn’t the only thing that needs to adapt to each season. A pair of brown suede deserts boots will see you through any season. Also consider investing in a great pair of leather boots for our typically British autumn/winter weather – black, brown or burgundy are all great options. 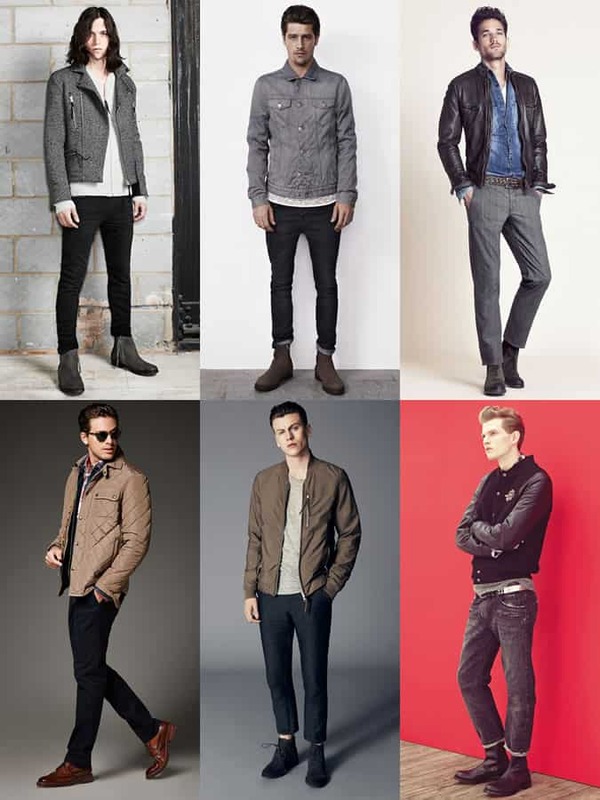 Try experimenting with the types of looks you integrate your casual footwear into. As long as the design remains simple, classic and versatile there’s no reason why they can’t be utilised in more formal outfits. As you can imagine, this is only half of what has been discussed in the Fashion Basics series. Tomorrow’s article is going to cover the more formal/tailoring side of the style spectrum, along with men’s accessories, some handy lessons we’ve learned with regard to colour and texture, and other miscellaneous ponderings.